Lately, people have started taking hygiene too seriously. Some people are so serious that they end up taking 2 showers on a daily basis. People have actually turned into hygiene-obsessed machines, unaware of the simple things about cleanliness. Below are a few examples of common exaggerated hygiene misconceptions. Even though we believe that soap has the magical power to destroy bacteria and germs on our hands, that's not specifically what it's doing. Regular soap just picks bacteria off the skin's surface and flushes it out along with water. Unless you're using an anti-bacterial soap, you're not killing bacteria at all; you're simply moving them from one place to another place. You may be washing your hair daily; however, it is not essential to wash it daily. Shampoos and soap remove natural sebum from your hair. So in fact, shampooing daily may leave your hair dry and brittle. The secret is finding a balance - don't shampoo all the time, however, don't drop it altogether either. OK, they may be comparatively dirty; however, getting infections in these bathrooms is rare. In order to contract an STD, viral hepatitis, E. coli infection or any other infection from a bathroom seat, contact with it is necessary. These bacteria solely survive on the surface of the seat for a restricted time, thus it's not possible that they'll cause infections all the time. This is not true! Sweat is largely made up of water and is odorless. The bacteria on the skin along with the sweat produces body odor. According to studies, antibacterial agents like sanitizers are not as good as they claim to be. 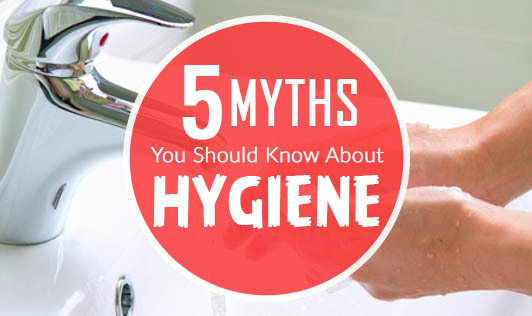 These were some of the Myths of Personal Hygiene, which you may or may not have been aware of. Hopefully, some of the doubts and questions regarding personal hygiene have been cleared.